Awarded Speaker of the Year for United Way, Adrienne Slaughter has been inspiring listeners nation-wide since she was a teenager. After her unexpected survival from childhood Bone Cancer, with only 1% chance of living, and then, being diagnosed with Breast Cancer in 2009, she today leads an active, healthy, positive life. Author of "The Change: Book 8 - Insights Into Self Empowerment", she enthuses its readers, individuals one on one and audiences nationwide of all ages, sizes and types. As the "party planner extraordinaire", Adrienne also organizes major events and fundraisers, with audiences ranging from 5 to 500! With a "never-ending smile", she will delight and inspire YOU. 2x Cancer Survivor Adrienne Slaughter inspires, motivates, empowers and brightens the world as she #speakswithasmile. This short (under 4 minutes) video will uplift YOU and brighten your smile. Perfect to share. Nothing slows Adrienne down. She stays active playing tennis, snow-skiing, rock climbing and working out daily. She even danced in the Rio de Janeiro Carnival! Keynote Speaker to over 1000 High School students and teachers at the 33rd Annual Orange County Career Forum, sponsored by the Constitutional Rights Foundation, Ms. Slaughter motivates, stressing confidence and the importance of positive role models. Held at Orange Coast College, Costa Mesa, CA, on 3/24/17. Inspiring at the Cancer Support Community's Girls Night Out for the 3rd time, Adrienne shares her smiles onstage to a sold-out crowd on 10/6/16 at the Comedy & Magic Club in Hermosa Beach, CA. On 9/26/16, Ms. Slaughter emceed this Memorial Medical Center Foundation Team Spirit 5K fundraiser for the 4th year in a row. Seen here with Long Beach State cheerleaders after Adrienne "high-fived" and congratulated every participant at the finish line at Granada Beach/Belmont Shore area of Long Beach, CA. 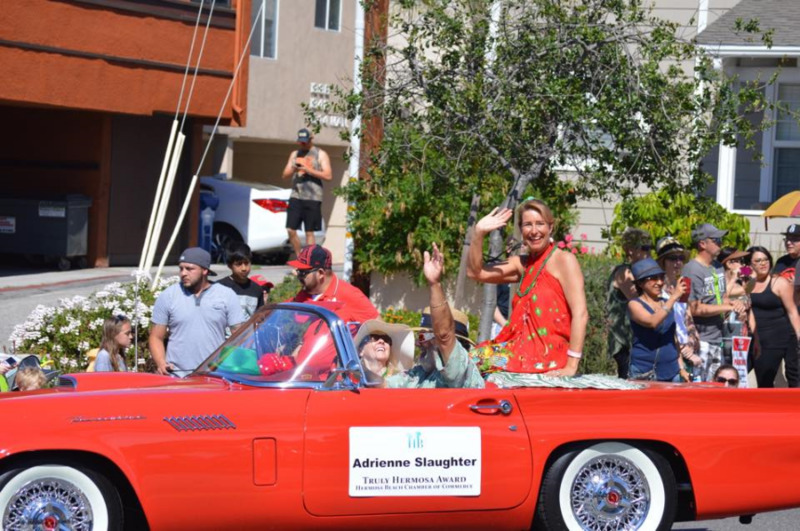 Adrienne Slaughter, honored in the March 17, 2015, St. Patrick's Day Parade in Hermosa Beach, CA, as the Truly Hermosa Award Recipient. The LA Dodgers and the American Cancer Society invited Adrienne Slaughter to toss the Ceremonial 1st Pitch at the May 1, 2015 Dodgers game at Dodger Stadium. As American Cancer Society's 2015 Hero and Voice of Hope , she successfully threw the baseball to home plate. For the 3rd year in a row, Adrienne Slaughter was the Emcee & Keynote Speaker at the Team Spirit 10K/5K in Long Beach, CA, Sept. 27, 2015. This year's event raised over $200,000! This Inspirational Book Will brighten your smile! Take a journey around the world to an enhancing self-discovery, uplifting you and positively changing and inspiring every part of your life. Adrienne Slaughter's Chapter "How an A-Plus Attitude Turns Adversity into Achievement" will touch your world, with the power of POSITIVE. The perfect gift to INSPIRE you, your family, friends, loved ones, business associates, everyone - with a smile! For free delivery in South Bay area, please contact Adrienne for info. Inspiring and motivating over 1000 students and teachers, Keynote Speaker Adrienne Slaughter shares the importance of role models at the 33rd Annual Orange County Career Forum. Here, she answers questions from the audience about her artificial leg, necessary after her right leg was amputated due to childhood bone cancer in 1981. 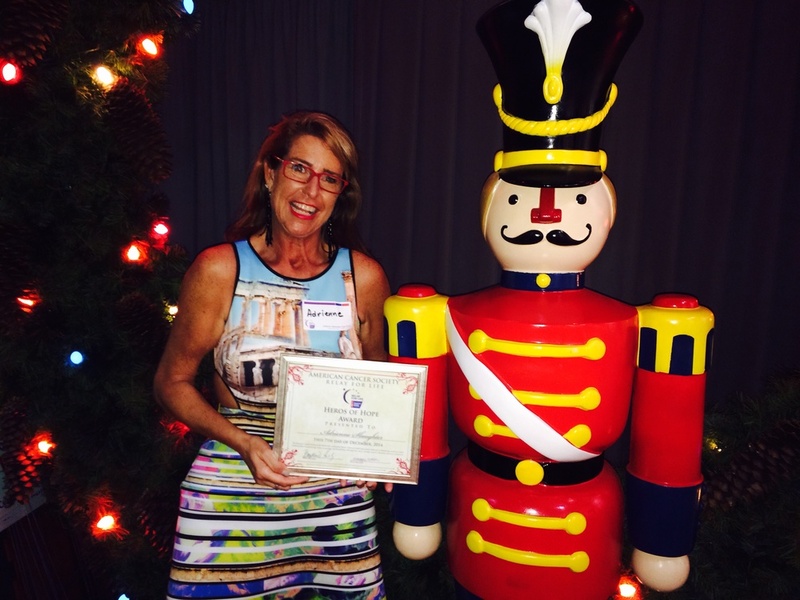 On March 5, 2016, Adrienne Slaughter is presented an award by the Woman's Club of Hermosa Beach for successfully founding and organizing the Adrienne's Search for Children's Cancer Cure. Now in its 10th year, she has helped raise over $100.000 donated to kids cancer groups and organizations. Adrienne Slaughter honored with the second ever "Truly Hermosa Award" on January 7, 2015 at the Chamber of Commerce Gala. It is awarded to an individual whose contributions stand out as extraordinary and exceptional. Awarded Hero Of Hope and chosen as the 2015 Voice of Hope by the American Cancer Society in December 2014 at the CBS Studios, Los Angeles. Adrienne Slaughter's The Change 8: Insights into Self-Empowerment, co-authored with 19 top authors from around the world, was published October 30, 2015, and includes her inspiring, motivating chapter How an A-Plus Attitude Turns Adversity into Achievement.